In his introduction, Don MacCaskill wrote modestly, 'I think I became a naturalist'. He was, in fact, one of Scotland's foremost naturalists and a remarkable wildlife photographer as well. In a flashback to his early years in Kilmartin, a village in Argyllshire, we learn of his awakening interest in man's relationship with the wildlife all around him - why was it necessary to kill it? And when accident, or fate, took him into a career in forestry, an inborn love of trees, both in woodland and forest, flourished and became his life. Photography came a little later, mostly as a record of what he was discovering in the natural world, but is of a remarkable quality in a time when modern aids to getting that special photograph of mammal or bird did not exist. This book is an account of his first year at Ardgarten, as a young forester newly out of college. Full of enthusiasm and confidence, he thought he knew everything and there was many an occasion when he had to discover that he didn't! It is an honest and often humorous account of forestry in the days after the Second World War when the forest folk of that time, who often lived in isolated communities 'far from the madding crowd', were genuinely interested in the work they were doing. There were some fascinating characters too! Trees are surely the supreme example of a life force stronger than our own, wrote Don. Some, like the giant redwoods of North America, live for thousands of years. Some, like our own oaks and pines, may live for centuries. All, given the right conditions, will regenerate their species and survive long into the future. Don wrote, 'I love trees'. It was true - he couldn't help it. A timely and collectible new edition enhanced by the inclusion of an additional 60 stunning b/w photographs in a hardback edition that is sure to find favour with all readers. 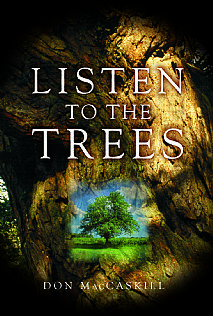 A truly delightful book that will be a joy to read especially for those with a particular interest in trees and woods, the natural world and anyone looking for an engrossing read told with humour.